uuid : 0dd51a34-cd91-4d13-b7fc-9617406b2fd2 templates_id: 119483 templates_uuid: "9fb7ae2e-7785-4730-b298-449d5c53c67a" title: "Model release letter - Make a free photography release " display_name: "Model release letter" meta_keywords: "Photography release form or photo liability waiver" description: "
Use this model release letter or waiver to obtain permission from an individual to use material featuring their image, or the image of a child of whom they are the parent or legal guardian. Having a signed waiver can give a business protection should the individual appearing in the material decide to bring legal action against them. In general, when material is being used for commercial purposes, a model release form should be obtained from the people being featured, as their image constitutes personal data for the purposes of the data protection regime. What\'s a model release letter? A model release letter is a letter by which the subject of a photograph or video footage gives permission to use and publish their image. It is the contract under which one party agrees on the use of their image by another party. Why do I need a model release letter? If you wish to use an individual\'s image, it is good practice to require them to sign a model release letter. By doing so, the model waives their rights in relation to the released image. This therefore protects you from potential claims in relation to the use of the individual\'s image further down the line. How can I use the released image? In a model release, the model grants the business permission to use the content in one form or another, for example on websites, blogs, marketing materials or printed publications. This means the said image can be edited, copied, modified, exhibited, published or distributed without any right to inspection or compensation for the model. Can images be exempt from the data protection regime? When an image is being used for journalistic, informational, literary, artistic or research purposes.
" created_timestamp: "2018-10-08 04:36:17.0" modified_timestamp: "2018-10-08 04:36:17.0" active: true created_by: 236 modified_by: 236 dcm_id: 359 url_slug: "Model-Release-Letter" meta_description: "This model release form or waiver can be signed by the subject of an image, giving permission to a business to publish their image for a specific purpose." time_to_complete: "10 minutes"
What's a model release letter? 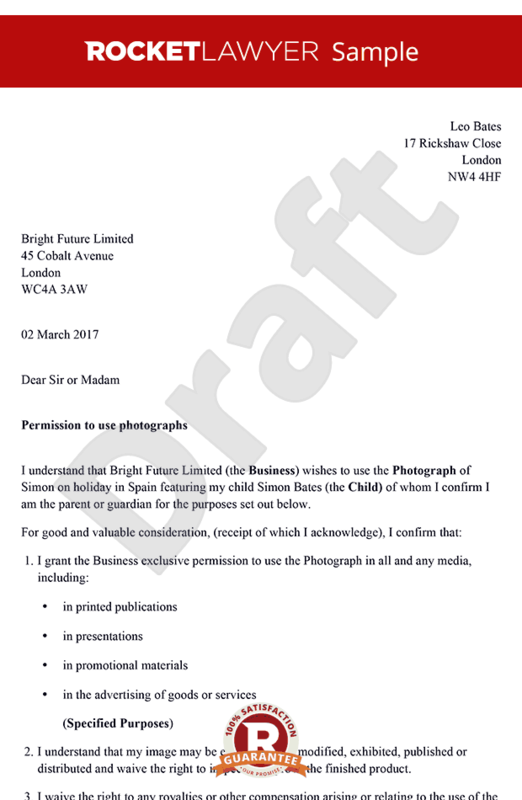 If you wish to use an individual's image, it is good practice to require them to sign a model release letter. By doing so, the model waives their rights in relation to the released image. This therefore protects you from potential claims in relation to the use of the individual's image further down the line. More than just a Model release letter template, our step-by-step interview and guidance makes it easy to create your document. Easily create online, download, print and sign your free Model release letter in minutes. This document is also sometimes called: Photography release form or photo liability waiver.